Pacha Du Polder finished second over Grand National fences in the Fox Hunters' Chase at Aintree last April. Victoria Pendleton was unseated from odds-on favourite Pacha Du Polder at Fakenham on the jockey's first start under National Hunt Rules. The double Olympic cycling champion was unhurt on the Paul Nicholls-trained mount in the Switching Saddles "Grassroots" Fox Hunters' Chase. Pacha Du Polder appeared to be impeded by Baltic Blue at the seventh fence. "More than anything it's a bruised ego but it won't put me off," said Pendleton. "You have to expect a setback at some point and this was one of those days, unfortunately." Pendleton, 35, is aiming to ride in the Foxhunter Chase at Cheltenham in March on the same horse. She added: "I hope Cheltenham is still the plan." 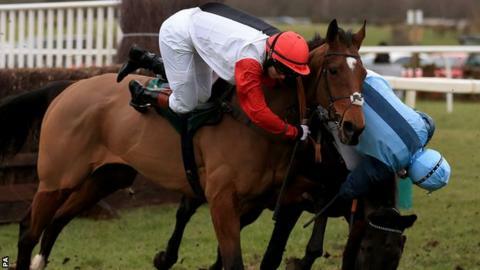 The former cyclist was riding the nine-year-old Pacha Du Polder for a second time, with the pair having been beaten in a photo-finish at Milborne St Andrew point-to-point in late January. Pendleton, who fell from her mount Working Title in the novice riders' point-to-point event at Barbury Castle last Sunday, gave her mount time to find his feet, initially dropping him out at the rear of the six-runner field. Pacha Du Polder gradually warmed to his task and was moving closer to the leaders when he unseated Pendleton. Pendleton and Baltic Blue's rider Carey Williamson crashed to the ground, but both riders were soon on their feet. The race was won by 8-1 shot Vasco Du Mee (8-1) with Good Egg (11-2) second. The fall was probably somewhat luckless because Pendleton's mount was momentarily distracted by another rider being unseated, and there was probably some contact, but that kind of hurly burly is a staple diet of horseracing. She said her advisers will make the final call about Cheltenham. They must decide if she's made enough progress to line up at jumping's highest pressure event in just a month. Cheltenham is sometimes called the Olympics of racing but, unlike the real Games, at which Pendleton has won two golds, it does happen every year.